The importance of the outdoor environment for the Pre-school child. 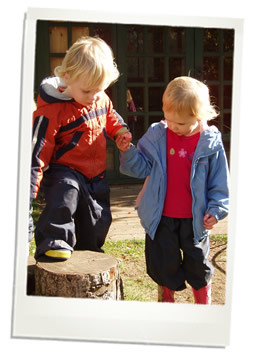 When young children go outside they are generally loud and active! They shout, roar and hoot. They run, jump, swing, climb. They are driven to do these things because their bodies tell them that there is a need to be active and a need to take in as much oxygen as possible to fuel the activity (hence the gasping and roaring!!). Montessori says that ‘children learn through movement’ and freedom and space have this beneficial effect on children which is so essential for the growth and development of the gross motor skills. Having fun outside fosters a happy association with active outdoor play which hopefully will last through to adulthood bringing vital health benefits with it. Ask a group of parents what they consider to be the benefits of outdoor play and you will hear a long and varied list probably including: fun; adventure; confidence building; role-play; health; fresh air; activity; spatial awareness; balance; ‘letting off steam’. All well-known facts. Yet dig deeper and look closely at your child in the outside environment and you will see more subtle forces at work. Children are naturally helpful and love to please so when the first rush of physical activity has waned, purposeful activity can take its place. Given the right tools and a realistic task, children will rise to the occasion with very little encouragement because they like doing ‘real’ things. Children can sweep, dig, move sand and compost, rake leaves, and collect twigs. They can paint fences, hammer nails and wash patios. They can clean out rabbit hutches and put in clean bedding. Real work raises their self-esteem and they feel good about themselves. It is a feeling they want to repeat. This real work helps a child make sense of the real world and his place in it. He is helped to sort fact from fiction –vital for children who watch a good deal of fantasy on TV. A sympathetic and patient adult will see that a child’s view of work is quite different to the adult’s concept of work. The child works at the process of working and not the end result which is the adult goal (consider the child washing-up – he will wash the same items over and over). A sensitive adult will not interfere, criticise or ‘take-over’ when faced with the child’s contribution to a task but allow the child to work at the process of working. The outdoor environment is not all ‘work and no play’ ...it is an adventure. The natural world of mud, water, soil and sand are the perfect medium for early physics lessons of weight, density, volume and flow! Patterns and beauty in nature fascinate young children and feed their curiosity and creativity. The living creatures under a stone can be gently investigated and the care and concern shown by adult role models will be shared by children. Montessori describes an area of a child’s development, called a Sensitive period, when children are intensely interested by objects so detailed and tiny that they may escape our notice entirely. Yet the child seems fascinated by a tiny feather, beetle or even a hair. In this way the child is driven to explore his world. The changing face of the garden through the year is a natural way to learn about time passing. When seasonal changes are linked with an activity such as, raking leaves or planting radish, then an association is made. Children who learn the names of dinosaurs can also remember the names of those first spring flowers when the search is made into a game. Let them cut the flowers for Mummy and they will want to know the name of each flower. In the civilised environment of our society the modern child lives far distant from nature and has few opportunities of entering into intimate contact with it. He spends time in a car seat or a buggy with nature just out of reach; for the child, sadly, needs to fit in with adult time. Nature has, for many children, little by little, been restricted by our ideals to the growing of flowers and the keeping of pet animals. Often the parent takes on full responsibility for both - keeping the child further from nature. Is it any wonder that some children grow into adults who plunder, pollute and destroy nature without even being conscious of what they are doing? Yet if the young child is shown the complexity, beauty and fascination of the natural world in a ‘hands-on’ approach with a positive adult this early beginning could result in a life-long appreciation and care of the natural world.